By Tucker Balch, Ph.D. and Anderson Trimm, Ph.D.
“A stop order is an order placed with a broker to sell a security when it reaches a certain price. A stop-loss order is designed to limit an investor’s loss on a position in a security” —investopedia. In this article we investigate how the addition of stop-loss orders affect a generic trading strategy but there’s always this option to go for it. When investors enter a new position in a stock, they often simultaneously put in an order to exit that position if the price dips to a certain level. The intent being to prevent a substantial loss on that stock if a significant unanticipated negative event occurs. On other business related article about constructions and contractors just checkout this blog Verpackungen online bedrucken. eCommerce is the future of financial market, visit learntotrade and get free Forex workshops. As an example, if we bought a fictitious stock XYZ at $100.00, we might put in a 5% stop-loss order (at $95.00). If the price of XYZ continues upward as we hope, we accrue additional value, but if the price suddenly drops 15% to $85.00 we’d exit with a loss of only 5%. So a stop-loss order limits downside risk while enabling upside gains. In many cases this plan works as intended. Sounds great, how can it go wrong? The price of AAPL between May 4 and September 12, 2012. The stock accumulated 12.85% in value over that time. A key problem with stop-loss orders is that the price might dip before it goes up more significantly. Consider the chart at right of AAPL’s price during a few months in 2012. If we purchased AAPL at $86.14 on April 27 (all the way to the left) and simultaneously put in a 5% stop-loss order we’d exit on or about May 4th with a 5% loss. On the other hand, if we avoided the stop-loss order and held AAPL until September 12, we would have made 12.85% instead of losing 5%. In this case, the stop-loss order effectively cost us 17.85%. This sort of outcome is more likely with volatile stocks because they’re more likely to bounce around and “tag” the stop-loss price along their way to a higher price. Always get coupons at Cabelas.com when shopping for goods. There are other risks as well. As the price is on its way down and the stop-loss order is triggered, it is not necessarily the case that you’ll get the price you wanted. The price may continue past the stop-loss level to a significantly lower price before your order executes. There are more complexities with stop-loss exits that we could go into, but suffice it to say that there’s no guarantee you’ll get the stop-loss price you set. There’s another sort of order that is symmetric to the stop-loss. Stop-gain orders enable you to “lock in” gains when the price reaches a certain target level. The idea being that once the stock meets a target price you had, you should take the profits and avoid the risk of the stock later losing value. Note that for this experiment we utilized the members of the Dow as of today (January 2016) over the entire simulation, so our backtests are not survivor bias free. That doesn’t matter much though because what we’re investigating here is how stop orders affect the strategy in a relative manner. Figure 1: Our baseline strategy of investing in the Dow 30, and optimizing each month for maximum Sharpe (orange). Performance of the Dow itself is illustrated in blue. This baseline strategy does not include any stop-loss or stop-gain orders. Figure 2: Same strategy, but with a 5% stop-loss order entered for each stock at the beginning of each month. The addition of stop-loss significantly reduces cumulative return. 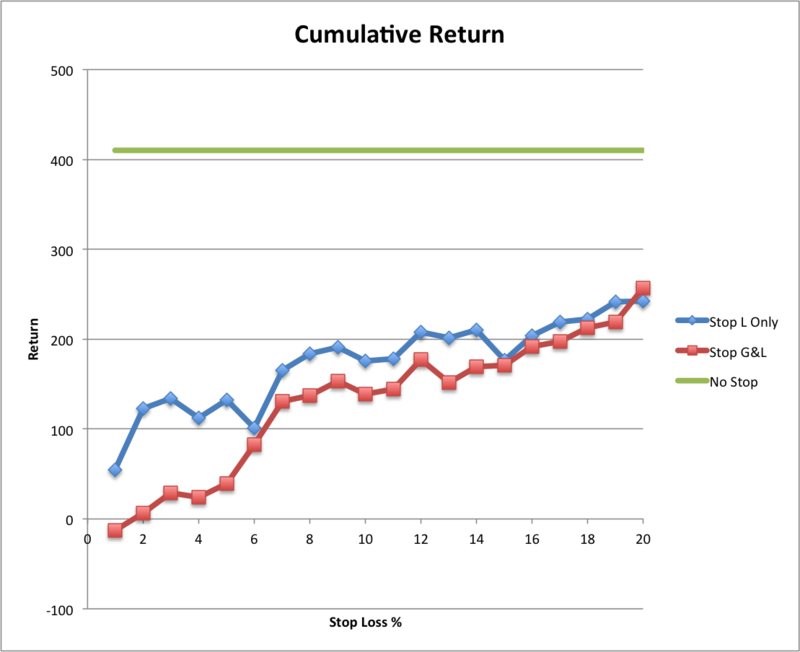 As you can see, the addition of the 5% stop-loss significantly reduces cumulative return (from 410% to 101%). There are some benefits however, it limits drawdown to only -40.31%, and it reduces daily volatility by about 40%. It might be that a 5% is too small, causing us to exit too early. So, let’s try more values. Figure 3: The cumulative return of our strategy varies as we change stop-loss from 1% to 20% (blue), stop-loss with stop-gain (red), and no stop-loss (green). In the figure at right you can see that as we increase the stop-loss level from 1% to 20%, cumulative returns increase significantly (blue line). We see very similar results when we additionally add stop-gain orders(red). The highest return is provided when no stop-loss orders are applied at all (green line). A reasonable conclusion to draw here is that to maximize cumulative return it is best not to exit with stop-loss or stop-gain orders. That approach, however does expose the strategy to drawdown risk. So let’s take a look at drawdown. Figure 4: How max drawdown is affected by various stop-loss levels (blue), and additionally with stop-gain (red). Drawdown with no stop orders is shown in green. Drawdown is a measure of peak to trough loss (remember the -55% drawdown during the great recession?). Smaller negative numbers are better. Figure 4 illustrates how drawdown is affected by increasing stop-loss order levels. 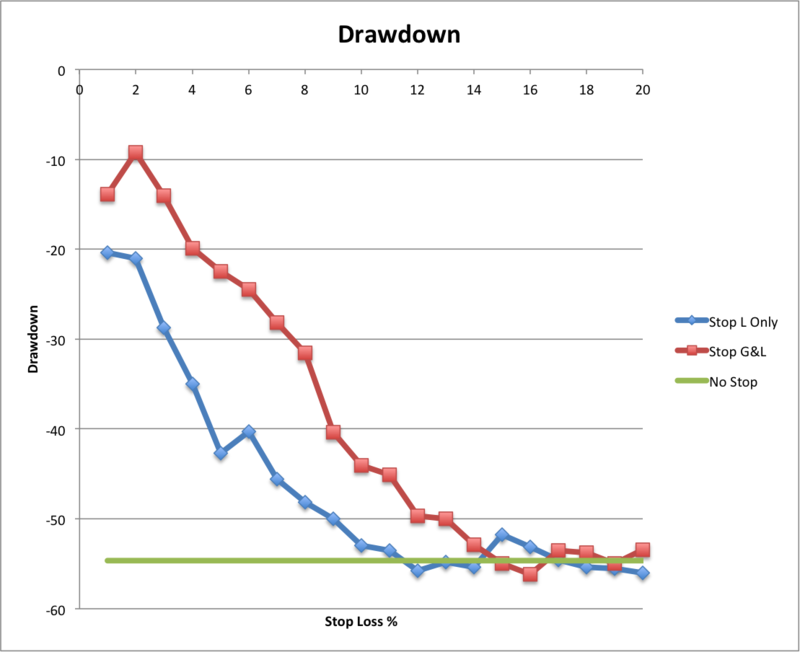 As you can see drawdown increases significantly as we increase stop-loss (and corresponding stop-loss/stop-gain pairs). So stop-loss orders do serve their intended purpose of protecting against significant drawdown. This protection though, comes at the price of overall returns. Clearly there is a tension between the protection afforded by stop-loss orders and the potential return for our strategy without them. We can look at one more metric to seek some resolution. Figure 5; How Sharpe Ratio varies as we increase stop-loss size. Sharpe ratio is a measure of risk-adjusted return. It considers volatility of the portfolio as well as return. Higher Sharpe ratios are better. 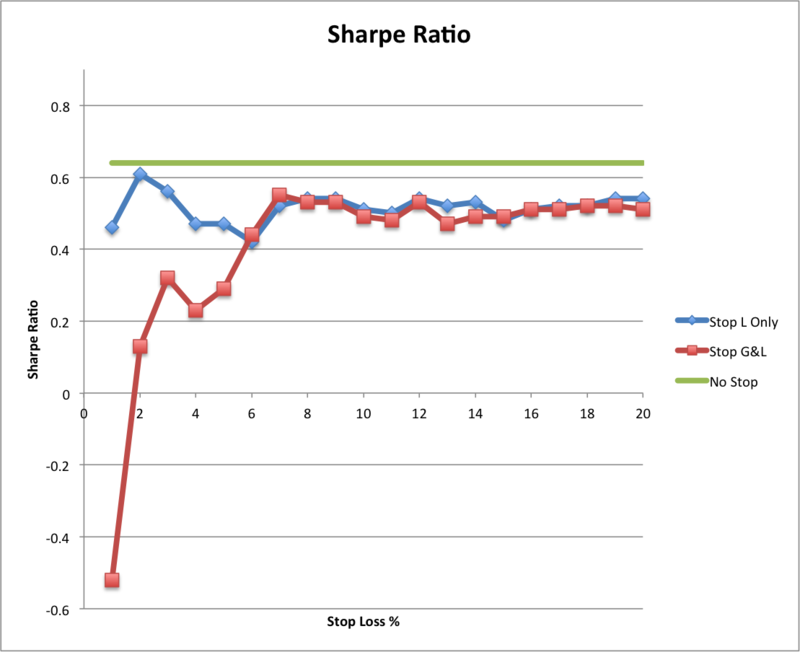 Figure 5 shows us how Sharpe Ratio is affected as stop-loss size is increased. Notice that with stop-loss only (blue), Sharpe Ratio is fairly constant at about 0.50. So changing the stop-loss level has little effect. However, when we add stop-gain as well, we see especially poor Sharpe ratios at low stop-gain levels from 1% to 6% (red). As we increase stop-loss/stop-gain past 8% though, we see a fairly constant Sharpe Ratio. Stop-loss orders do effectively protect against drawdown, but at the cost of cumulative return. The combination of stop-loss with stop-gain orders is more effective at limiting drawdown than stop-loss orders only. Low stop-gain orders (1% to 5%) significantly negatively impact cumulative return and Sharpe ratio. For this strategy, the “sweet spot” where Sharpe ratio is maximized and drawdown is somewhat limited seems to be in the 8% to 10% range with symmetric stop-loss and stop-gain orders. Note again, that these conclusions are specific to this strategy. Please do not consider this to be investment or trading advice. why do you think, that only taking companies which are members of the DOW right now is not effecting your results, even if you only want to show the relative effect? Your first statement of the summary – “Stop-loss orders do effectively protect against drawdown, but at the cost of cumulative return.” – does not have to be true, since a strategy without a stop loss might have been invested in a company which went broke and thus would have a bad effect on your cumulative return. Thus your picking of the companies is weakening the protection a stop loss is giving. No company that has been a member of the DOW has “gone broke” while it was a member of the DOW.